Last year the people of Niger in west Africa were suffering from a long drought, with 70% of cattle herds under threat. See article here. In August, the Archbishop of Niamey, Michel Cartatéguy SMA, visited his Irish SMA colleagues in Cork. The Archbishop, a proud Basque, has been a missionary in Niger since 1979. He explained that this year it is not drought that is threatening the people’s livelihood but floods! He has many projects set up to help alleviate the immediate hunger of the people and other projects to help rebuild their homes and establish new cattle herds etc. 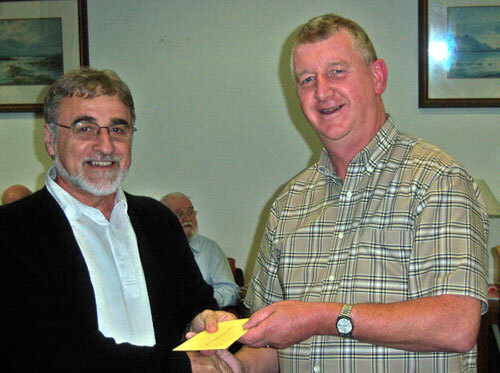 During the visit the Irish Provincial Leader, Fr Fachtna O’Driscoll SMA (on right), presented Archbishop Cartatéguy with a cheque for €2,000 which the Province had received from a Donor who wanted it to be used For the Greatest Need. Other donors have also generously supported the people of Niger (nearly 100% Muslim). The Catholic Church is highly regarded by the Government and people of Niger (13.4 million) for their charitable work. During his visit the Archbishop shared a Circular Letter he had sent to many people about the situation in Niger. Here is a translation of what he wrote. “The rainy season seemed to be good. Plenty of rain fell all over Niger. In Niamey, where I kept a keen eye on the Rainfall measurement, we had the same amount of water as last year. We prayed that the rain would continue to fall until October and so hope for a good harvest. But last year we missed a couple or three final ‘rains’. The famine we then experienced was in part due to the absence of those final ‘rains’. Too much rain is not always beneficial. The River Niger – the third largest in Africa – flooded and destroyed more than 1,300 homes and 500 hectares of cultivated land around Niamey. The increase in the amount of waterwas due principally to exceptional rainfall in the area where the Niger flows. The old people in Niamey said they’d not seen anything like it since 1929! The rain also caused terrible damage in Tillabéry and Dosso. People affected by the destruction gathered in schools where they received assistance and food. There has been a polemic between the flood victims who want a dam built so that they can rebuild their homes and the government who want them to build in a different area in order to avoid a repeat of the flooding. – Up to now we have distributed hundreds of tons of cereals in collaboration with the World Food Programme. The recipients of Caritas Niger – Muslim and Christians – whom I visited in their areas have been well prepared to make good use of these cereals. They also expressed their gratitude for what has been done for them. If our funds allow we still hope to distribute a further 1,000 tons. – At the same time the Nutrition unit of the Catholic Church has treated 15,000 children. While the children are undergoing health care and feeding in the Centres, their mothers are getting courses in different topics dealing with malnutrition, hygiene, vaccination, breast-feeding etc. When they leave the Centres they return home with soaps, anti-mosquito care, clothes sheets and bed covers. – We also established a ‘Cash for Work’ programme but not in the way we had envisaged in our previous Diocesan Action Plan. Last June the government stopped this type of programme. But they allowed us to continue ours until July 2010. And so we have been able to recover 500 hectares of flooded land, 71 kms of rural roads rehabilitated, 22,000 metres of water drains built. 8,867 families were involved in this work in 5 areas – Agadez, Dosso, Tahoua, Tillabéry and Zinder. We were able to do this through the generosity of Caritas International, private donors and donations from people in Ireland sent to us through the SMA Irish Province. – As of now we have 60% of our Budget and we hope to get the remainder so that we can continue our Relief work up to December 2010. I repeat again my sincere thanks and the thanks of the people for your contributions and support in our time of need. But our work as Church is not just in helping people who are suffering and in need of help. We are in the Holy Muslim month of Ramadan. The Ministry of Commerce invited shop keepers to drop their profit margins as a sign of solidarity with the people during Ramadan. During the Holy Month there is need for 15,000 tons of Rice, 10,000 tons of sugar and 6,000 tons of cooking oil. The Government gave a good example by foregoing the tax due on the sale of cooking oil. Niger is celebrating its 50th Independence anniversary. The government planted trees as a symbol of their efforts to battle against the increasing desertification in the country. The National Consultative Council is working on a new Constitution. They also adopted a motion to pardon those who took part on the February 2010 coup d’etat. The new Constitution is under consideration by the government before a referendum in October. Archbishop once again repeated his thanks to all for their concern, prayers and material support. If you would like to help Archbishop Cartatéguy with this work please click on the Donate Online button now. Your support WILL make a difference and 100% of what you give will go to the people on Niger.